A lot of times when I buy new clothes (or new to me clothes), I hold off on wearing them for a long time because I hate when they lose that new feeling. But the things I thrifted and shared in last week's Thursdays are for Thrifters link up, I can't seem to stop wearing. I knew there was something I loved about this shirt the minute I saw it, but it looked huge. Still, I carried it to the dressing room and tried it on. It's a size medium, but could fit about four of me in it and comes almost to my knees (when it's not belted). I'm not sure exactly how it's meant to be worn, but I'm belting it and wearing it as a dress. And I'm pretty sure this thing was made for me, whatever it is. Remember that tomorrow is the next Thursdays are for Thrifters. Can't wait to see your finds and outfits from this week! 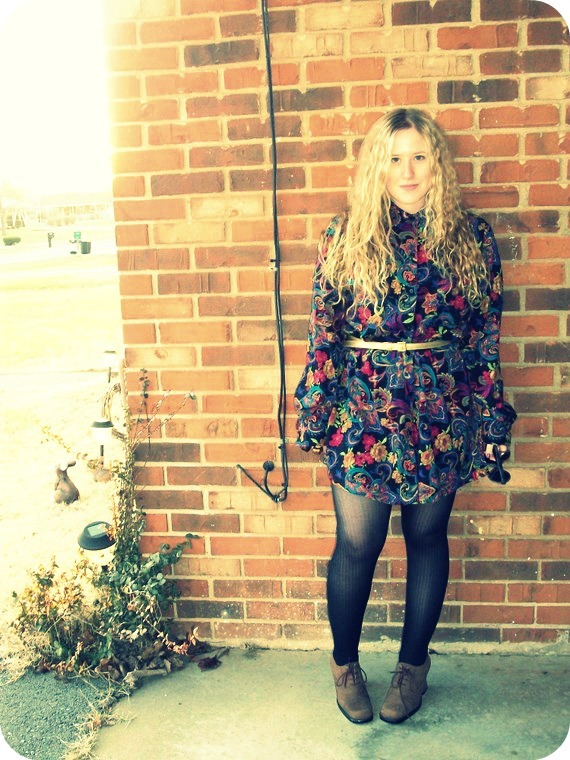 Dress/Shirt Thing: Thrifted, $2.50., Tights: Betsey Johnson, Gift., Belt: Old Navy, apx. $6. 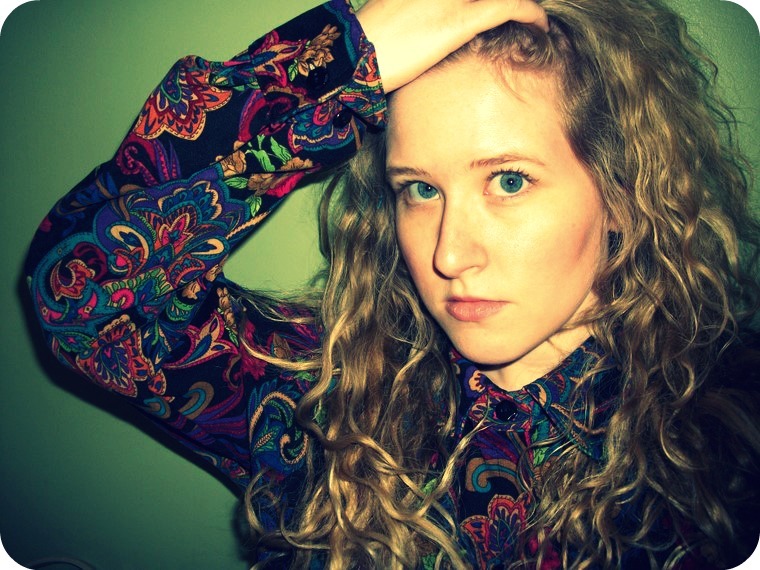 Labels: oversized paisley shirt, oversized shirt, paisley, shirt dress, thrifted, what is it? I also love the peace earrings, I really need to buy some like that. It's lovely! And I totally understand your new clothes thing- I like that excitement of knowing you have something excitign and new to wear (except for the lovely John Rocha dress I hvae now have for 3 years but is only suitable for weddings and I've been invited to none!!! you thrifted those shoes?!? theyre so gorgeous!! Oh, I love the colors in 'the thing'. It looks great as a dress. Your blue eyes show up so beautifully in the pictures. love the shoes, and that dress is so amazing. It looks like it's embroided? anyway, looking gorgeous! That print is so eye catching, and I like that you pared it with the pink shoes. Super Cute Dress. I'm Opposite I wear my new clothes right after I get them. Your dress is beautiful, the pattern is absolutely gorgeous :) And your shoes are so cute, I love shoes that have laces! That dress/shirt was totally made for you! I love the print and how you paired it with that metallic belt! the fabric in the shirt is wonderful! And I can't believe you thrifted the shoes! Great dress!! $2.50? What a deal! Btw, your hair is just gorgeous! I love finding stuff I just need to have, even if I can't figure out why! And what a great colour combination in it! This might be one of my favourite looks on you- the pattern of the shirt/dress is just phenomenal! I love the way you belted it. It looks great as a dress. It looks good with a belt! Thanks for the comment on my blog! Do follow back if you are interested! :) Thanks! Gorgeous print on the dress! The bag and shoes are so cute. You have some amazing thrift skills! 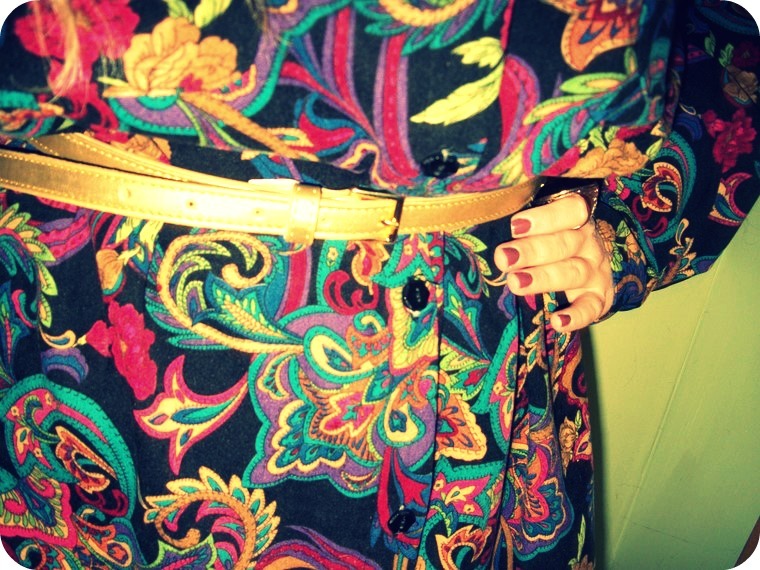 I love the look of it worn with the gold belt as a dress! Those shoes are great too. I can see why you've been wearing it a lot - super cute! I'm in love with your vintage bag that's a fab find. And the dress is just gorgeous on you.